E.J. 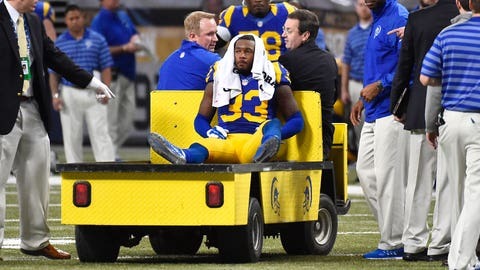 Gaines’ 2014 season ended with this Week 15 injury against the New York Giants. Another injury will keep his 2015 season from ever even taking place. Coach Jeff Fisher confirmed Gaines’ injury and recovery period Monday after the team opened three days of workouts in Southern California. Fisher also expressed confidence that the Rams can fill the void with the players already on their roster. "To come in as a sixth-round pick and get an opportunity because of injury and keep the job, I thought it was a very impressive effort last year by him," Fisher said. "We were counting on him. We were going to create competition between Trumaine and he this year and see what happens, and it’s just unfortunate. He’ll be back 100 percent. It’s just not any time this year." Fisher isn’t worried about his secondary even though the Rams didn’t draft a defensive back last spring. Lamarcus Joyner, a second-round pick in 2014, is expected to be St. Louis’ nickel defensive back, while Marcus Roberson is ahead in the race to be the fourth cornerback. Undrafted rookie Imoan Claiborne also is showing promise in camp, highlighted by his interception in the Rams’ preseason-opening loss at Oakland last Friday. "Tru is off to a great start," Fisher said. "Marcus is playing well, and LaMarcus also is doing a good job for us, and Jenks is Jenks. We’ve got a good group, fortunately."